Cover event, banquet, buffet or display tables with 8 foot Polyester Black Fitted Tablecloths at your wedding, trade show event or formal presentation. These easy care machine washable cloths drop 30 inches to the floor and make for a clean and tailor fitted look. Made for tables with dimensions of 30"W x 96"L x 30'H. Due to variations in computer monitors, colors shades may vary in appearance from screen to screen. Please search Ultimate Textile for matching and complementary items in all shapes and sizes. 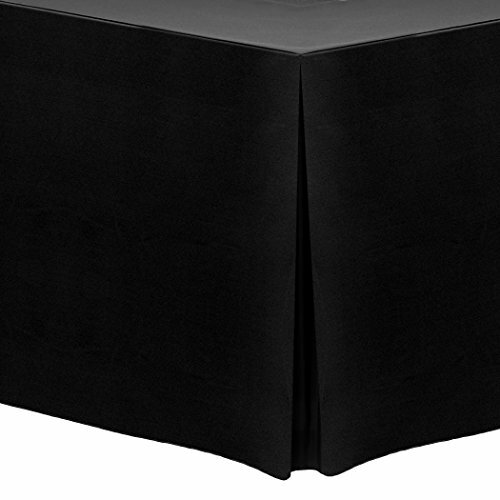 Black 8 foot Fitted Tablecloths are an excellent choice for trade shows, catering and buffet folding banquet tables, hotels and party rooms.